The endeavor that currently goes by the name LEARNING SITES has its roots in the late 1980s when The Buhen Project founder the late Bill Riseman began to realize that there were more uses for his computer-aided design (CAD) program (called DataCAD, with its accompanying simple shading program called Velocity) than making the process of designing buildings more efficient. He began to apply his proficiency with the software to the problems of archaeology, working closely with Timothy Kendall and Peter Der Manuelian, then assistant curators in the Department of Egyptian, Nubian, and Near Eastern Art, at the Museum of Fine Arts, Boston. Riseman slowly started expanding the envelope of what was considered possible with fairly simple, by today's standards, CAD tools and rendering software, creating stunning graphics and inventing new applications for the tools to broaden our understanding and appreciation of the past (you can view more of his work on the Early Project pages). 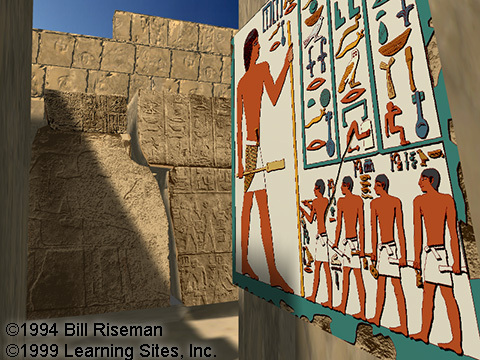 From research to presentation graphics, Riseman used these 'new' tools for reconstructing Egyptian hieroglyphics faster and with greater accuracy than previously thought possible and for digitally re-placing entire buildings onto their original topographic locations. His results were dazzling; and some of his activities even led to changes in the software code to accommodate his achievements. He was a true pioneer, innovator, and visionary in the application of CAD technology and a master of integrating and melding software and hardware. Independently, archaeologist Donald H. Sanders had been pursuing alternative methods of analyzing ancient built environments and seeking the means to express graphically the kinds of interpretations he was developing. From his teaching experience, he understood how frustrating it can be to try to explain the nuances of an archaeological site or ruined building to a group of undergraduates using only traditional visual aids--plans, section drawings, and site photographs. To the untrained eye, ancient sites look like piles of rocks; even to the expert, section drawings of an unfamiliar structure are often difficult to decipher and the use of space is difficult to visualize using only plans. There had to be a better way to engage students, arouse excitement about the past, and understand the ancient world from new points of view. Sanders met Riseman at a trade show in Boston in 1992. Each immediately realized the benefits of the other's expertise. Subsequent to that chance meeting, a close working relationship emerged and the original goals each had set merged and broadened as they explored what were then merely distant buzz words: virtual reality, hypertext, and multimedia. However, several ideas quickly coalesced, including trying to revolutionize public education and scholarly research, and digitally preserving archaeological data that are languishing and actually deteriorating in existing archives (explore those ideas further in the Cultural Heritage Concerns section of this Introduction to Learning Sites). LEARNING SITES Inc. was founded by Sanders in 1996--now the oldest and most experienced virtual heritage company in the world.